My mum just paid the course for me & didnt ask much. Thanks so much! & maybe im piercing back my naval next week with my precious ! DT week next week , good luck guys ! Gogogo ! Its that time of the year again foryou to get set for ROMPIII 2008. Limit age - 16 & above. We want you to be part of the HOTTEST,and MOST SOUGHT-AFTER Underground hip-hop freestyle dance competition of 08! Three times funkier & thrice asgroovy, sizzle up your summer & getset to size up5 hip-hoppin' freestylin' dance teamson ROMPIII's grand stage @Zouk! Witness firsthand as the final 2 teamsdance-off for the ULTIMATE HIP-HOP TITLE! & featuring special appearances &performances by prominent icons ofSingapore's hip-hop scene,this is a dance battle you simplycan't afford to miss. RESPECT THE BEAT AND BE THERE. CONTACT ME FOR THE BEST PRICE!! Oh well , im soooo pissed with this year. Why everything seems to be against us? -_-"
Secondly, every year's best class tends to have the air con class. This year, my class dun have it. Thirdly, this year's O lvl will be starting earlier & finish the last paper later then the other previous year & taking the new syllabus . Like HELL . HOW CAN ?! This post will be a nagging post, as im feeling so _______________ . My O lvl Physics SPA is on monday ! Hell, pray hard that I'll get good grades! & ya , i injured my leg on thurs again. There are so many scars on my leg already! zz . Hello lovelys :D Such a tiring day for me today. Morning, went for Xcountry, ran e bedok res alone. I got 34th position & i didnt get any trophy! ): Cabbed home after that, went home for lunch & pack my bag. Off to sentosa with peijuan, glovor, cassandra & delyvn in e afternoon ! 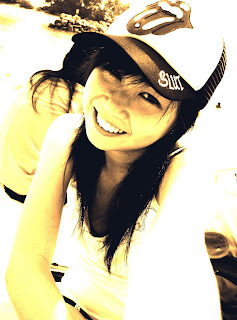 :D The whether is so bloody hot man, luckily i bought cap, sunglasses & sunblock lotion while cassandra brought umbrella. :D We are so kiasu, rofls. We sat the skyride, fun & scary! Then, we settle down at silso beach. Bought subway to eat. Was sitting all e way, taking photos & chatting. Saw baobaoPrecious & queeny there. Haha, they two cute la~ Then 6plus, took train back to HeartlandMall, went PizzaHut for dinner & home ! I enjoyed my day with them even though there's only 5 of us . :D Im so so tired now.